‘And Fire Came Down’ is the second novel by Emma Viskic – after ‘Resurrection Bay’ – featuring Australian insurance investigator Caleb Zelic. ‘Resurrection Bay’ scooped up an array of literary prizes in Australia, winning the 2016 Ned Kelly Award for Best Debut and three Davitt Awards, and has now been shortlisted for two Dagger Awards by the UK’s Crime Writers Association: the Gold Dagger for best novel and the New Blood Dagger for best first novel. Viskic’s second effort is a worthy successor to her first. ‘And Fire Came Down’ is as skilfully written and plotted as ‘Resurrection Bay’, a high-tempo, engaging read, in which every dialogue, every observation, every situation is sharp, spot-on and intriguing. Above all, Caleb Zelic is a unique fictional creation, and not just in the crime/noir landscape: a man in his late twenties with an iron determination to function normally despite his deafness, the result of contracting meningitis as a child. 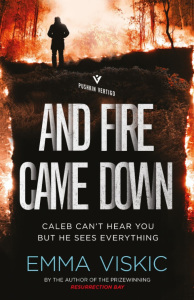 Seen from Caleb’s perspective, ‘And Fire Came Down’ is as much about investigating a crime as it is about being different and disadvantaged, and not feeling sorry for yourself. In fact, about how you try all the harder to overcome your handicap. Caleb is willing to play with the hand that life deals him, and to pay the price for the risks he takes. But sometimes he does try too hard, and the price exacted from him, and those close to him, is extremely high. Caleb is persistent beyond stubbornness, something which is most apparent in his efforts to hide his deafness from people, relying on lip reading, context and luck to understand what they say. And it is also apparent in his utter unwillingness to let go of a case, even when he doesn’t have a real stake in it and when the odds against him surviving it are getting progressively longer. At the start of ‘And Fire Came Down’, Caleb is in Melbourne, where he lives and works. He is still recovering from the ordeal narrated in ‘Resurrection Bay’, when he and his wife Kat nearly lost their lives. They lost their own connection in the process too, and split up, with Kat staying in their native town of Resurrection Bay. While out jogging, minus his hearing aids, Caleb comes across a young woman who’s clearly running from some danger, and tries to communicate with him. He doesn’t know her but she apparently knows him, or was directed to seek help from him. While Caleb tries – in vain – to understand what she says, the danger becomes real, in the form of a thug who launches himself at the woman. She runs for her life and is run over and killed by a car, dying literally in Caleb’s arms. The dead woman, whose name will eventually be revealed as Portia, becomes Caleb’s next case. He is retained by no one but himself, and he turns out to be the most demanding of clients. Portia’s trail leads Caleb back to Resurrection Bay – someone who knew him there directed her to Caleb in Melbourne – where it turns out Portia had roots too, a powerful ex-businessman of a father who seems little stricken by her death. In the town of Resurrection Bay, Caleb is plunged into a world whose denizens are at once very familiar and vaguely hostile, and make for an interesting cast of characters. Besides creating an original hero, neither cop nor private eye or journalist, yet someone who deals with crimes while always retaining a deep sense of humanity, Viskic is adept at populating her novels with intriguing, sharply sketched characters and at weaving their stories into a feelingly portrayed locale. Resurrection Bay may be a small town, but its people, especially its Aboriginal Australian inhabitants, have deep roots there. It is a place where nature is harsh but beautiful, where loyalties are fierce and grudges deeply held. A place where a white man like Caleb, despite having been married to a local Aboriginal Australian, still struggles to fit in. Though fit he does somehow, since family ties are sacred and Caleb has become family – besides having family of his own in Resurrection Bay – his former-drug-addict-now-reformed brother Anton. Viskic does a great job of immersing her readers into this tightly knit, sometimes suffocating community, populated with powerful female figures such as Caleb’s ex-mother-in-law Maria, who runs a clinic, or local matriarch Aunty Eileen, and of course Caleb’s ex-wife Kat, a subversive figure in her own right, for being an artist and marrying a white man. Viskic keeps the plot ticking at a fast clip, though there is occasionally the sense that it is the folks of Resurrection Bay, with their stories and relationships, which are dearer to the author’s heart than the plot itself. In fact, from a purely crime fiction perspective, ‘And Fire Came Down’ suffers a little from the fact that the victim isn’t perhaps as close to Caleb as those in the first novel. This doesn’t in any way make him less willing to accept frightening risks to uncover the truth about Portia’s death, it just makes his efforts seem occasionally incidental to other narrative streams that ebb and flow throughout the novel. To be very clear, I don’t see this as a weakness in ‘And Fire Came Down’. I found Viskic’s portrayal of the tensions within the Resurrection Bay microcosm, with its family ties, black vs white and affluent vs poor dynamics, truly fascinating. But lovers of plot-driven thrillers should know to expect something slightly, subtly different from ‘And Fire Came Down’. There is a credible, gripping ‘crime’ side to the story, and Caleb will work incredibly hard to unravel the mystery of Portia’s death, leading him to brush dangerously with biker gangs and industrial-scale drug dealers. But, more so perhaps than in her first novel, Viskic is interested in showing us the world within which Caleb and the people close to him live, with all its joys and frustrations, safe havens and dangerous places, open-heartedness and (chiefly racial) prejudice. It is a fascinating world, very cleverly painted through a prose that is spare and yet extremely effective, with a narrative touch that, though deceptively light, has an uncanny ability to skewer conventions and pierce through to the truth. 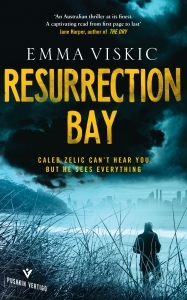 Emma Viskic is a great writer, with a gift for transporting readers into a world both familiar and exotic, and for writing about truly original characters – Caleb above all – and I look forward to the next instalment of Caleb and Resurrection Bay stories!